Hello World! Welcome to Colors of Zhar website where we proudly showcase our friendliest and most affordable services for all your events needs from weddings, to engagement, to debuts and birthdays, to photoshoots; or any other special occasion where you will require a trusted name in the hair and makeup business. As most of you might have already known, we officially launched our website a week ago (October 5, 2015) and we consider it as a huge milestone for the team. Here at Colors of Zhar, one of our goals is to always update you guys with the latest beauty trend, provide you with hair and makeup tips and tricks, showcase our services, share our new promos, news, and upcoming events. With this, we decided to harness the trusted name in website development, Papalidium Solutions to build the website for us. 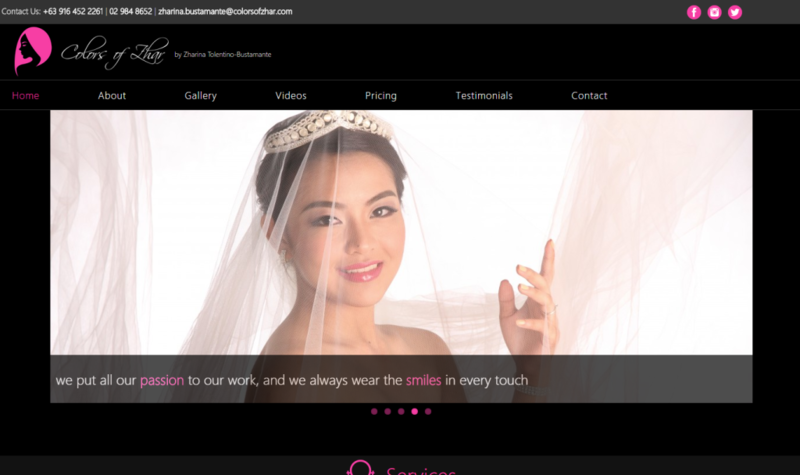 The website is a product of meticulous design, hardwork, and dedication – and the result is a beautiful and elegant platform, and a design with a touch of mystery. Thank you again for dropping by – and stay tuned for upcoming posts and latest happenings. Until next time! © 2019 Colors of Zhar. All rights reserved.